BMW eDrive meets BMW xDrive - a pioneering combination delivering efficient driving pleasure: The BMW Concept X5 eDrive. The Honda Accord Hybrid today won the 2014 Canadian Green Car Award. 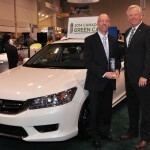 A panel of top Canadian automotive journalists selected the Accord Hybrid from among five other category winners as the vehicle that best combines environmental benefits and mass-market appeal. 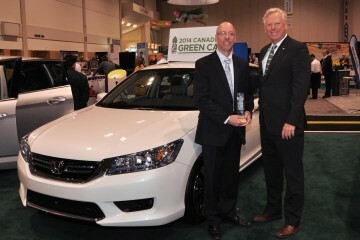 David Miller, President and CEO of WWF-Canada, presented the second annual Award trophy to Dave Gardner, Vice-President of Sales and Marketing with Honda Canada Inc., this morning at the Green Living Show, in Toronto’s Direct Energy Centre. “One important way we can build an environmentally sustainable society is by making transportation choices that have a lower impact on the planet, and that includes greener cars,” David Miller said. “The Accord Hybrid helps achieve that goal with its impressive efficiency, which is key to lowering greenhouse gases and improving local air quality. The Accord had won the Hybrid category, in a tie with Volkswagen’s Jetta Turbo Hybrid, in an earlier selection round, after extensive testing and assessments by the 19 judges.